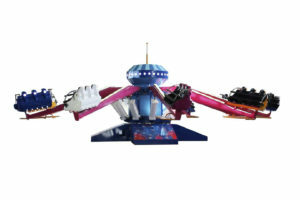 Park model Amusement Ride designed for the whole family complete with painted base structure, decorated and lighted rotating center with top moved by electro-mechanic transmission, 10 lighted arms fixed on the rotating center and moved by a pneumatic system. Each arm is provided with 1 decorated car of 3 seats for a total capacity of 30 riders. Cars are lighted and equipped with aluminum painted footboard and stainless steel safety bar, lap bar opened automatically by operator. 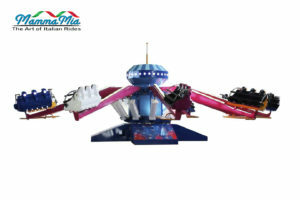 The ride is provided with air compressor for pneumatic system, electronic board with PLC control board for operator with 7 motion programs.